Last night, during my wild mild New Years eve carousal, I had my fortune told by a friend at a bar. Between sips of whiskey-sour, I casually examined some of her colorful tarot cards. They were in their own way lovely and intriguing things, and New Year’s being a night of hope and forward-thinking, it seemed fitting. For now I’ll leave off the topic of whether I “believe” in such practices and phenomena, as I’m not the sort to make absolute declarations about the many mysteries of our little-understood reality – especially when it comes to the slippery subject of Time. Really, I find absolutes to be generally bad things, contrary to our innate creativity and the sense of wonder which enables all art and science to succeed. If I have a personal ideology, it would be the consistent rejection of ideologies in general. “All I know is that I know nothing”, said Socrates, maybe the wisest thing ever uttered by anyone. Anyway, my tarot reading was pretty positive, with an exception. It called for me to seek solitude, to reconnect with my truest self. This was apparently essential for my happiness and success, and according to the cards, my path to good fortune had to be a lonely one. 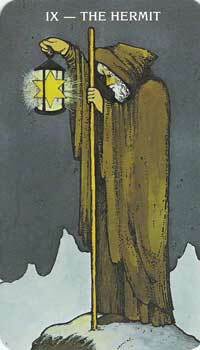 I looked down at the Hermit card, a robed and white-bearded fellow with a thin walking stick, and thought about my general dissatisfaction with things lately. I felt a strong and unexpected agreement with the cards’ advice, felt it somewhere deep inside my guts. Now, this is a tricky thing, as I happen to be in a long-term and happily committed relationship with a lovely lady, and have no burning desire to return to the solitude of bachelordom. Whatever the cards may say, I could not sacrifice love in pursuit of art – it would be in a way the antithesis of its own goal. Though it’s true that relationships, for all of their benefits, can certainly strain one’s sense of self, and infringe on the creation of peaceful, mental space. Add the fact that I work full time and take evening classes, and it’s clear that solitude is not naturally occurring in my present life. Even when I’m alone, I’m not – I keep company with the distractions of the internet, or an author I’m reading, or the emotional swells of music. To be “alone”, truly and fully, is harder than it sounds. Yet when I think of the people I have most admired in history – artists, scientists, “tortured geniuses” of all kinds – they tend to share an appreciation for solitude. Rilke was a major advocate for it as absolutely necessary to the artist; for the “journey within”, which enables true creation. Wilde knew it too, and da Vinci, Picasso, Gaugin, and Osho. Cicero called solitude the pabulum of the mind. Einstein relished his autonomy and alone time, and would likely not have made half of his achievements without it. There seems to be a common sentiment that solitude foments the purest creativity and insight, and from my own experiences, I think I agree. This raises tough questions, as someone who wishes to devote his energy to creation and exploration. What about love? Or friendship? Do relationships and sociality cripple the creative process? Can I achieve my best while living in this busy, fully-inhabited life? Or must I retreat to the cliche cabin in the woods, cut off all distractions and duties, and devote myself fully to art? Maybe. There is a lot to be said for full-speed, self-absorbed commitment to a singular process. But then, there’s also a lot to be said for balance. Actually, balance seems to often be the answer to existential quandaries in general. There is, after all, a lot of gray area between Thoreau and Jackie O. (of course in reality, Thoreau was actually very sociable, and much of his hermit-like persona is invented). I’m looking for that sweet middle-ground between focused isolation and the distracted integration of modern life. To find it, I believe I’ll have to create a dedicated time/space for creativity, somewhere between the necessary logistics and pleasantries of daily life, a temporary but periodic oasis. I don’t do well with time-management usually, though I blame that on Time rather than myself, that slippery and mischievous phantom. But I’ll have to try, and if anyone else out there has struggled with a similar dilemma, this would be my advice. Perhaps it won’t be enough, but it will be better than nothing. So today, in this spirit of self-rediscovery, and in search of that uninterrupted contemplation, I wandered about some woods a few miles from home. I spent this first day of the new year walking a trail along a steep gorge, resting occasionally to appreciate the babble of the brook and the ominous creak of tall pines bending to the wind. It was the first time in a long time that I was truly alone, in every sense. I hiked up and down hills, into groves of bare oaks and across rocky streams. I needed space to reassess and come to these conclusions; conclusions which may or may not work out in the end. But at least I feel better. I suppose that’s a start. The Right is using a Wikileaks email to claim that democrats had direct control over a popular comedy show. It is fake news. Bob Dylan wins the Nobel for Literature – But what it “Literature”?